Your teeth are important and so are your gums. After all, your teeth are held in your mouth by your periodontal ligaments and gingival tissue. If your gums become diseased your teeth will fall out. Today your Reno dentists, Dr. William Wager and Dr. Brian Evans discuss how to treat periodontal disease and retain healthy gums. Periodontal Disease is on the rise. Over 65 million adult Americans present with symptoms of gum disease. Like most diseases, if periodontal disease is caught in the early stages it is easier to treat and treatment outcomes are more successful. Periodontal disease develops when your gingival tissue becomes inflamed due to bacterial irritation or infection. The gum tissue begins to pull away from your teeth and pockets form along your gumline. 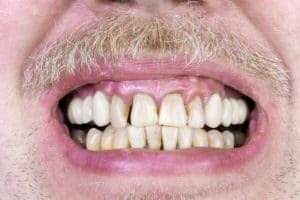 These pockets collect more bacteria which eat away at your periodontal ligaments and eventually your underlying jaw bone leading to tooth loss. A new, non-invasive treatment for early diagnosed gum disease is the Perio Tray®. An impression of your mouth is taken and sent to the dental laboratory for fabrication. When the tray is complete dentists prescribe a periodontal medication to be placed into the tray before applying the tray to your teeth. Patients prefer this treatment because it is painless, easy, comfortable, and convenient, and often used for only minutes a day.